For my DIY Chanel jacket bouclé I am turning to Mood Designer Fabrics, which has stores in Manhattan and L.A., and also a website. I have visited the bouclé section of Mood in the Garment District in Manhattan several times. It goes for the better part of a long aisle, shelves filled from floor to ceiling with bolts of the most lovely bouclé. Todd Kelly, one of the very friendly and knowledgeable staffers there, told me plenty of bouclé Mood carries comes from mills in Italy and France and is created by designers such as Oscar de la Renta, Marc Jacobs, and Carolina Herrera. 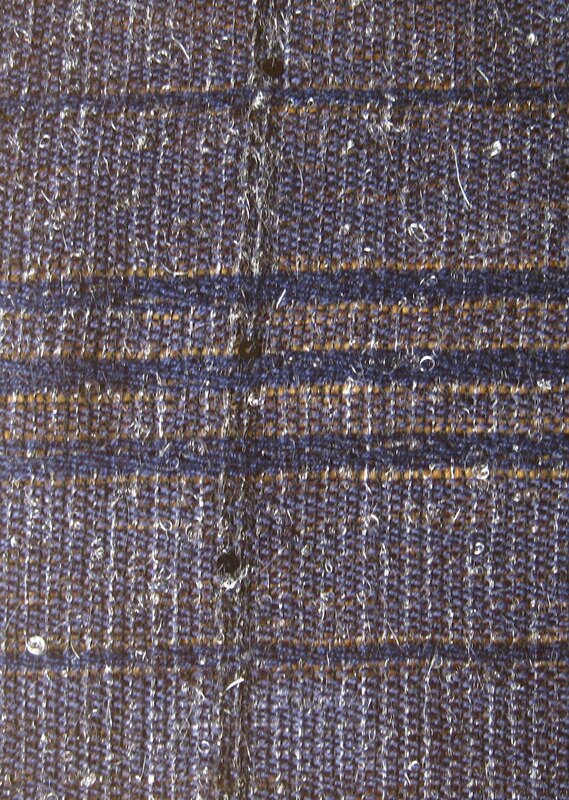 This fabric is available at Mood in NYC, but not online. The three swatches I have narrowed it down to are all by Oscar de la Renta (I love Oscar! ), and all are $40 a yard. 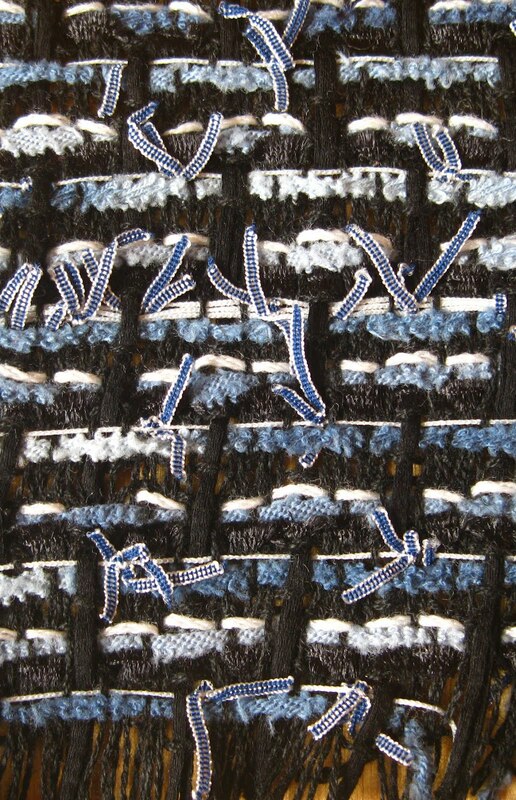 I’m a little partial to the black bouclé shown in the last picture, with off-white threads woven in. 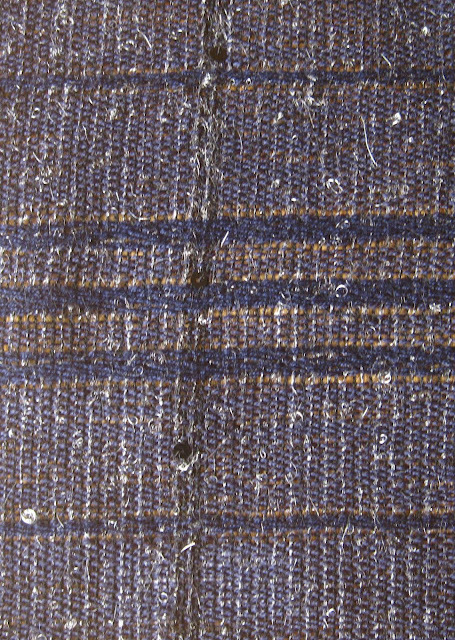 Some of the threads are champagne-colored, some are dove gray. The effect is gorgeous. 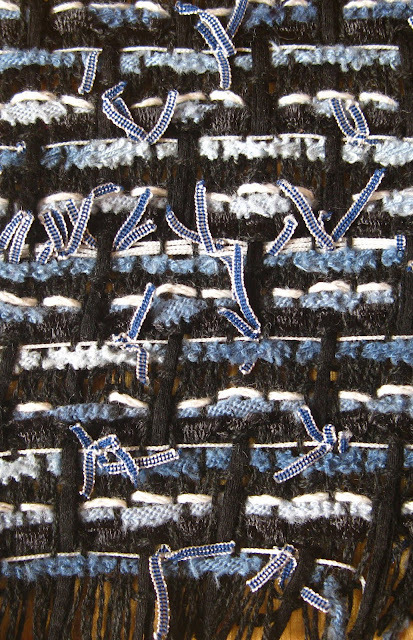 I love the tiny sequins woven into this fabric. This fabric is my current favorite. Of course I want the jacket to be special and the fabric to be unique. I plan on wearing the jacket with jeans or black pants so I’d like to keep the color in the black or blue range. But because it’s my first time sewing a jacket of this kind I don’t want to spend the serious money I’ve read you can drop at a place like Mendel Goldberg, another NYC fabric store, where bouclé can run you (I read over at Frabjous Couture) $300-900. At that price I might as well buy a vintage Chanel jacket and save myself all the trouble. Which could still happen but until I’ve saved up that little pile of cash it’s DIY Chanel all the way. Which of these three swatches do you like? And if you are sewing this jacket too, where are you getting your fabric? I second your choice--what are you using for lining? Of course, the only way I know Mood is from Project Runway!! I agree with your choice...I would pick the top one in second place, but your choice is unique and will look amazing with jeans or even a great pencil skirt. Can't wait to see it!! The last one for sure - though they are all lovely, I think you will not only wear the jacket more often in that black fabric, but you won't tire of it. It's so classic and beautiful. I like the first one with what looks like little bits of ribbon in it. How much of this fabric do you need to purchase? I like your choice as well. Have been to both store sites - I think I actually prefer L.A. The NYC store's new employee, Meg, used to blog about the Fashion District - great help navigating all the fabric and notion stores when you first visited NYC. I think your choice is best; I imagined finding three "already made" jackets with those fabrics and wondered which I'd choose if I could only pick one and it was the one you are leaning toward. I also think it's going to be the easiest to work with as a first attempt. If you have great success with this jacket, then you can always make the other two jackets! I'm loving your jacket-making posts -- wonderful topic for a blog, especially considering that most other blogs are only about purchasing things. You're a style hero. Sending best wishes for straight seams, tangle-free thread, and no lost pins. Oooh, I'm with you on your fabric choice, the one in the last picture really says "Chanel Suit" to me. I work at a Chanel makeup counter, would you like some Chanel ribbon to sew in your jacket, like a label? The third one is my favorite too. The one with sequins might slaughter some needles and the the first fabric may make seams more visible. That's my personal thoughts. Whatever your final choice, you're a brave girl to carry one this project. It will be great!!! Have a nice day Jill!